Today is my birthday. I’m not telling you that so that you’ll send me an email with congratulatory wishes–I’m telling you solely because it’s the reason for this column, today. You see, few people ever think to thank their Mothers for having them. Never mind nine months of rough livin’-of nausea; quirky eating habits; leg cramps; hair that goes limp. How about 22 hours of labor? Yes, our Mothers should be thanked every year that we have a birthday. At least thanked–if not showered with flowers and other gifts. Don’t wait ’til Mother’s Day–do it on YOUR next birthay. My Mother died, almost 19 years ago. Too young: she was too young, and I was too young to lose my Mommy. OK, I was 39–but I’ll always need her. Problem there. But here’s the thing: never can I go to the horse races–anywhere, but especially at Saratoga Race Course–without my Mother, my Mommy, leaning over my shoulder. Were it not for her and my Grandmother, I’d not be involved with the sport today. 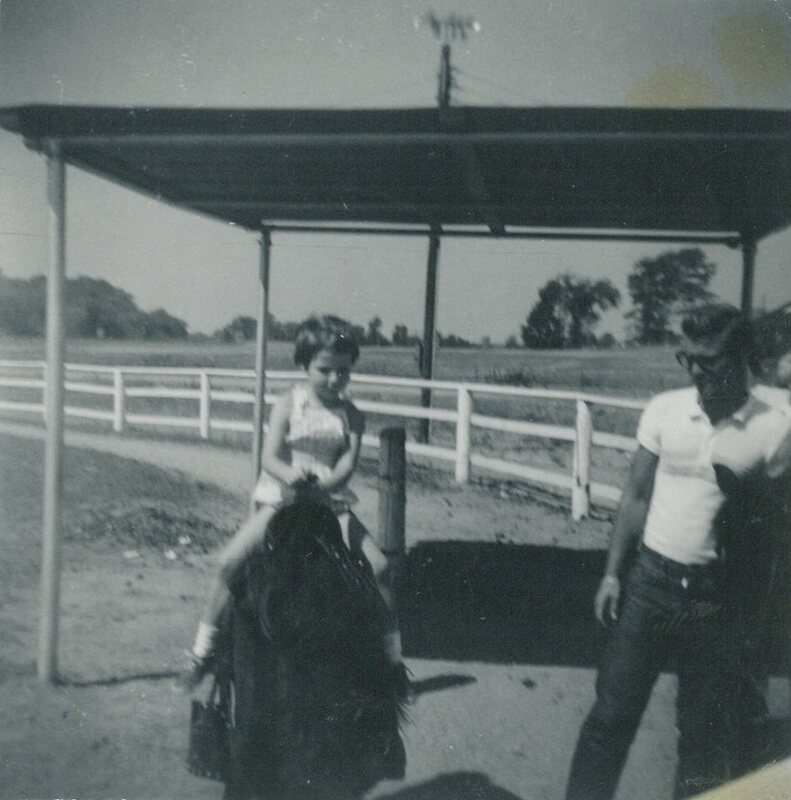 They put me on a pony when I was six months old. The next time, I was three. I began riding in earnest when I was four–the same year that they took me to Green Mountain Park and Saratoga. Last year, the insightful equine photographer, Juliet R. Harrison asked and about 22 other writers and me to contribute to a coffee table book that she was creating. The topic was memories of Saratoga Race Course. 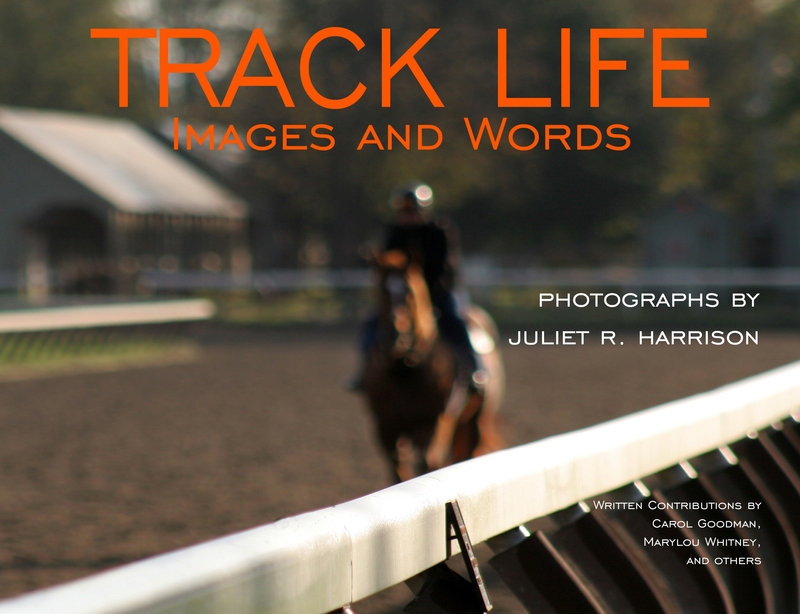 Unlike most such photography books, “Track Life: Images and words” is a book that was created around the words. From what I gather, most photography books are created by choosing the photos first, then descriptives are added after-the-fact. But Juliet wanted words–so when we submitted our horse racing memories to her, she found the photos that she’d taken that fit each person’s memory. I love this creative process of her–she really had to think about it, rather than merely finding a bunch of photos that looked nice between the covers of a hard-cover book. Well, I’m the writer who wrote the “morbid” memory. 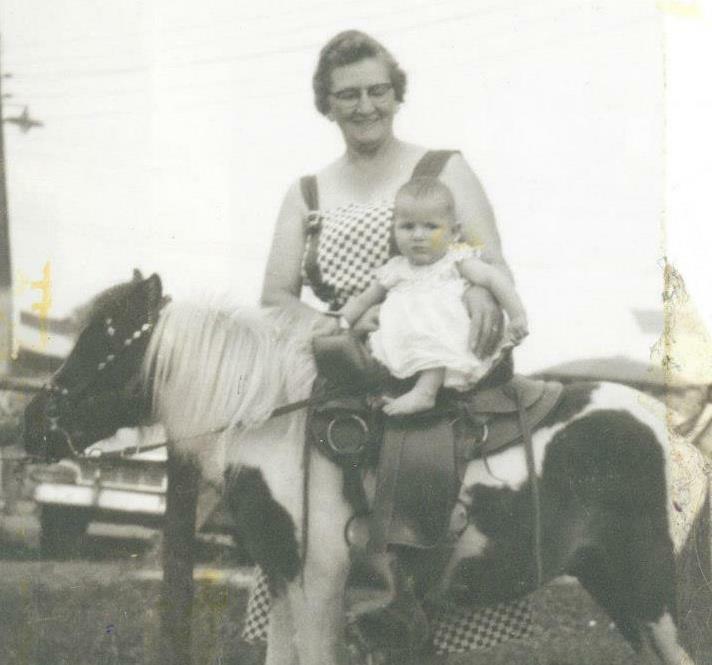 I wrote about my Mother’s dying years, and what horse racing meant to her at that time–especially two certain Champions, whom you’ll recognize. Yeah, I’m the one who wrote something somber, but it came from my heart. That’s all we can ask of a writer, isn’t it? So here, sans farther ado, is “Mommy’s Last Out,” from “Track Life: Images and Words.” Thank you, Mommy–Mary Evelyn Myers Altieri Thompson–for being the willing spaceship through whom I landed on this planet, 58 years ago. Thank you for having me–for keeping me–for loving me–and for teaching me that, after God–horses are my best friends. If I’m a freak for horses, blame my Mother. She’s the one who taught me the love of God’s equines, and the thrill of the race. 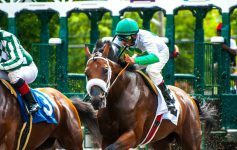 From age four, I was at a racetrack (Green Mountain or Saratoga) with her, observing her carefully-chosen 50-cent bets and absolute joy when her critter crossed the line first. As I grew into my teens and a bit beyond that, I did go to the track with friends. But attending with Mommy was much more interesting: friends wanted to hang out, flirt with jockeys and imbibe. Mommy wanted to sit on the Clubhouse Porch all day–eat a nice lunch, bet on her horses and be right there at the finish line when she won. Her passion for the horses and the sport was contagious, and apparently, congenital. I abandoned the friends for my racing mentor by the time I was 22. Mommy loved Holy Bull. She’d watched his two-year-old season in ’93, and decided that he was a Champion in the making. I’m sure that she experienced even greater joy than that known by even his connections. She was in the throes of her war with cancer that summer, and as she held Hope for Holy Bull’s future, she was driven to live, to see him race as a three-year-old. Sure enough, the summer of ’94, we all thought she was doing rather well–so well, in fact, that she made the trip to Saratoga and onto her Porch for Holy Bull’s Travers race. In the moments that he graced the winner’s circle, she pronounced that, if she died that evening, she could die knowing that she’d seen greatness in action. I agreed, but because I, too, had witnessed greatness in action–twice. By the following May, Mommy was a home Hospice patient, just four weeks from meeting Secretariat in Heaven. Intellectually sharp as a tack, she asked that I study the entries for the Kentucky Derby aloud, and help her pick. This was our last handicapping experience together. She liked Lake George for his name, she really liked Serena’s Song–but about Thunder Gulch she had “a feeling.” She couldn’t shake it, so in the days leading up to the race, we planned to bet him, long-shot and all. He won, she won, I won a memory that never will fade. Mommy died three days before her boy’s Belmont. I watched the race on TV, cradling the box with my Mother’s ashes and crying my guts out. I wept because she was so newly-dead. Because we weren’t watching the Belmont together, pounding on our chairs and screaming. I cried because it was so, so good, and so, so sad. Per Mommy’s pre-passing instructions, I attended the Travers in August. I went alone: I couldn’t stand to make inane chatter with anyone on such a long day. I was there just to see Thunder Gulch win. And of course he won–how could he not? I’m convinced that–besides the fact that he was immensely talented–Thunder Gulch took the day because he knew that my Mother loved him, and was giving him a hand ride from her heavenly perch. Thank you to all the horses whom my Mother loved over the years, and for the passion that she ignited in me. Thank you, bless you–Holy Bull and Thunder Gulch–for lovingly escorting my Mother through her last two earthly years. Indeed, weeping may last for a night–but the joy of remembrance truly does come in the morning. Previous Article Ode to a Horseman: Lenny DeVito, You’re in Our Hearts. And the Winner’s Circle. Next Article Women in Horse Racing Media: What’s Good for the f!llies and Mares…is Good for the Sport.